Here's a post that MIGHT actually teach you something! You see, I often have trouble giving out advice, because I just don't know if I make sense half of the time, or if my advice is any good considering I'm still learning stuff myself, so don't take any of this as THE TRUTH AND ANYTHING ELSE IS WRONG AND. Because this is just what I've come to learn. This is just sharing my experiences hoping it might help someone else. Dialogue, to me, is like the glue that holds the story together. Among other things, Dialogue can either make or break a story. Sometimes it's hard to find where dialogue belongs, how much is too much, how little is too little, and if it doesn't sound natural. Rule Number One: Dialogue should be consistent. It aggravates me in books where there will be a whole four to six pages FULL of back and forth dialogue. Sure, it fits the scene and is necessary--But then there is the next five to ten pages full of descriptions, thoughts and actions. This is inconsistent writing. To me, it's as noticeable and disturbing as a book switching from first person to third person, then back again. It's abrupt and basically just shouldn't happen. It may not seem so big a deal while writing, but it's one of those things to keep an eye out for. The most annoying part is; it can be fixed easily! You can't have constant conversation through your story--of course not, it might not fit and it may become TOO much--but you CAN slip in little statements here and there between the gapes to make it more consistent and less noticeable. It's the same if there is a long part of explaining or discussing through dialogue; put in breaks of action or thought to even it out. Rule Number Two: Never use dialogue to tell the READER something. And by this, I mean; If the reader already knows that they must go from point A to point B, don't have the character tell the other the same thing. If the characters already know this, it doesn't make sense for them to discuss it again for the readers benefit. To get across information like this, have the character thinking it, if it's something important. But learning it through the characters speech is just a bit grating and annoying. Unnecessary, almost. Rule Number Three: Dialogue should contain EMOTION. Dialogue should be a part of the story. Dialogue should convey as much emotion as the plot and the relationships and the events. Dialogue is not just making a statement, or saying something new. Dialogue should grow characters together, change elements in the story, and tear characters apart. It should do many things. Dialogue is a weapon, so use it wisely. 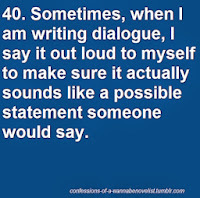 Rule Number Four: Avoid Dialogue Dumps. In each story, there is the beginning climax when a sudden event happens to throw the character into a new world, a self discovery; SOMETHING happens to make the plot begin, leading the character to the different life style, whether it be with elves or dragons or in the same room but a different mind set. And, after these events, there is usually a mentor, a friend, a wise old wizard, that knows what's going on, and they have to explain. Of course they do, part of the story is the main character being confused at this event or incident. It makes enough sense, but, this is the WORST PART FOR ME! You have to sit there and listen to this HUGE information dump about the history of the world, what is happening, the characters destiny, the answers to the main characters questions. This would be acceptable, if there wasn't another way. little by little, information should be given. NO READER will remember or get from this Information dump what the writer had intended. The reader, like the main character, should learn and grow to understand this new world, new life style, ect. like we learn ABOUT the main character; Slowly. Bit by bit you can drop information. You may understand and know exactly what is going on, and all of the history, but don't expect the Reader to pick up on it extremely quickly; You've had days, maybe months to figure this stuff out, while the Reader only has a few paragraphs. In one of my books, the first in a trilogy, the main character is constantly learning new stuff about the world, about her future, about herself, from the first page to the very last. Now that's 123 pages, over 40k words. So who ever said information needs to be given quickly? We should be taught like you learn from a math book; one page at a time, one problem and one answer at a time. Rule Number Five: Dialogue should be fun! 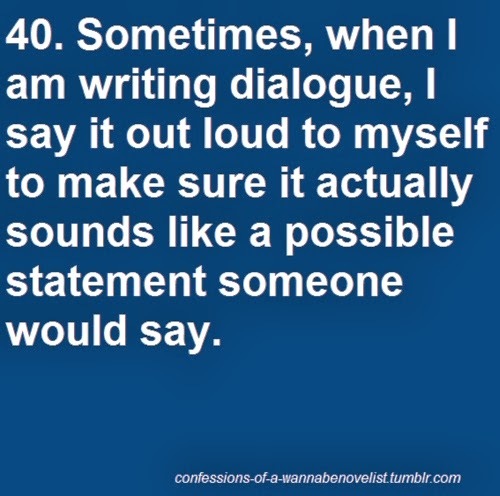 For me, Dialogue is that bit of the story I look forward to reading and writing. Through Dialogue we learn more about the characters, learn more about the story, learn more about the emotions and events. Dialogue should flow, should be quick and witty when needed, should be sharp and abrupt when needed. Dialogue should be sculpted and molded to the story and the scenes and the characters. Dialogue is fantastic, so have fun with it!